ayala is using Smore newsletters to spread the word online. At an oasis, the group encounters a professor who tells them of a hidden library overseen by a spirit in the desert, that was barn owl. Inside, Sokka discovers a crucial weakness of the Fire Nation's that could end the War: the date of an upcoming solar eclipse which will cripple the firebenders' abilities. 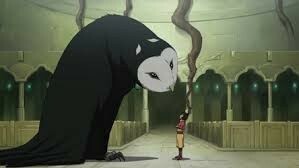 The spirit of the library, Wan Shi Tong, refuses to allow them to leave with the knowledge, and sinks the library into the sand. 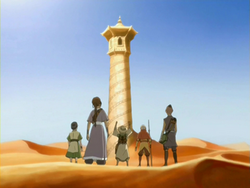 The team narrowly escapes the library, but is devastated by the loss of Appa, who had been captured by sandbenders while they were underground. 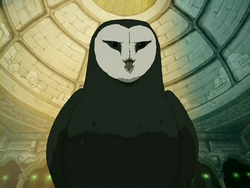 Wan Shi Tong is an ancient, wise, and powerful spirit who collects information for his Spirit Library, and thus is more knowledgeable than any human being. He never misses an opportunity to learn new facts or boast about his vast intelligence, though he has developed a certain distaste for human technology since leaving the physical world. Although his regular shape is that of a huge black-and-white barn owl, when angered he can assume much more frightening forms.